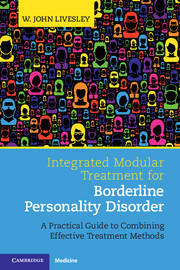 This clinical guide describes a different way to treat borderline personality disorder. Rather than using the currently available therapies, the author presents a trans-theoretical approach that combines the essential elements of all effective treatments. The book offers a framework for understanding the nature and origins of borderline personality disorder that is used to define treatment targets and strategies. Building on this foundation, systems for organizing treatment are presented around change mechanisms common to all effective therapies. Interventions are presented in modules, allowing therapists to select treatment according to the needs of patients. Treatment is explained by dividing therapy into phases, each addressing different problems. Methods are described to promote engagement, manage suicidality, treat crises, improve emotional regulation, restructure maladaptive interpersonal behaviours, construct a new sense of self and identity, and build a life worth living. The volume will interest mental health professionals from all disciplines and different levels of expertise. 24. Summary and overview: the treatment process across time. W. John Livesley is Professor Emeritus in the Department of Psychiatry at the University of British Columbia, Vancouver.